This fitting is suitable for masonry, concrete or wooden walls with inequality from 2 mm to 2 m.
Guide rails have to be placed at the distance of 60 cm from each other. Layout is marked from the wall. Marks to be put every 60 cm using the tape measure. These marks will be used to lay the guide rails. Guide rails are dry and even wood laths 15×40 mm in cross-section. Panels on the concrete, masonry wall or ceiling are fixed on the wooden guide rails. Wood laths 15×40 mm in cross-section are fixed to the wall or ceiling every 60 cm from each other. Make hollows in attaching points of guide rails to make sure nails or self-tapping screws heads will not be out creating inequality. Laths are fixed by screw anchors not less than 6×60 in size. The attachments points are in at least 50 cm from each other. If panels are to be mounted vertically, the guide rails have to be installed horizontally, and vice versa. Panels are installed with the tongue outward. Lay the first row on special wedges to keep the expansion space of 10-15 mm and adjust the horizontal or vertical level of panels. The first row is fixed to the guide rails via the fore side of the panel indented from the base at a height not more than the baseboard-to-be. To fix the row, use a pneumatic pin gun. The pins that are used to fix the panels should be at least 25 mm to ensure the proper fixation of panels to the frame. 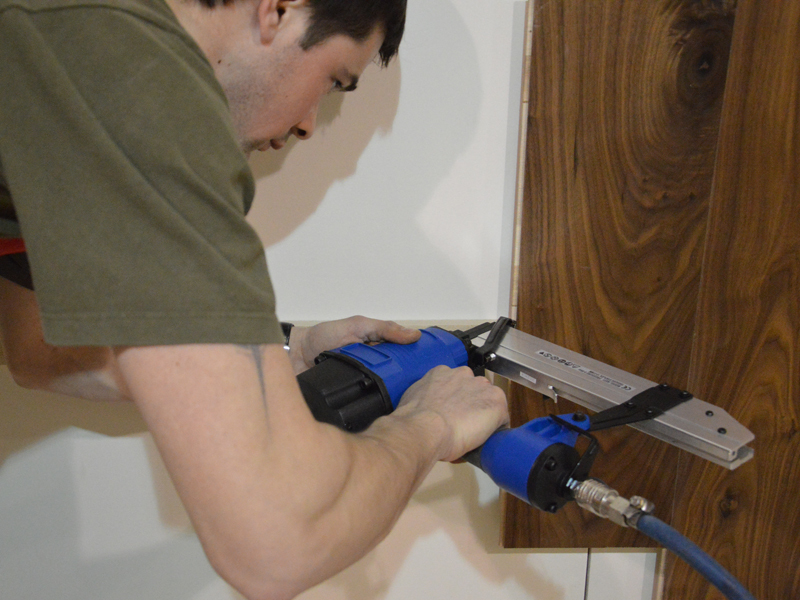 Panels are fixed to the frame by a pneumatic staple gun in the tongue at the angle of 45 degrees to every guide rail. The staples should be at least 40 mm in length. Fix the last row via the panel front side. Keep the indent from the ceiling at a height not more than the height of the ceiling baseboard-to-be. To ensure a subtle transition between panels, it is recommended to use transition mouldings in colours and finishes of wall panels. When laying the last row, keep the expansion space of 10-15 mm. If necessary, cut the panel along with a power jigsaw considering the expansion space. Mark and cut the panel only at the rear of the panel. When panelling columns, corbels and walls with outboard angle, use special transition mouldings. Lay the baseboard from the wall. Use a cross-cut to cut the necessary angle on the baseboard (internal/external) and fix it. 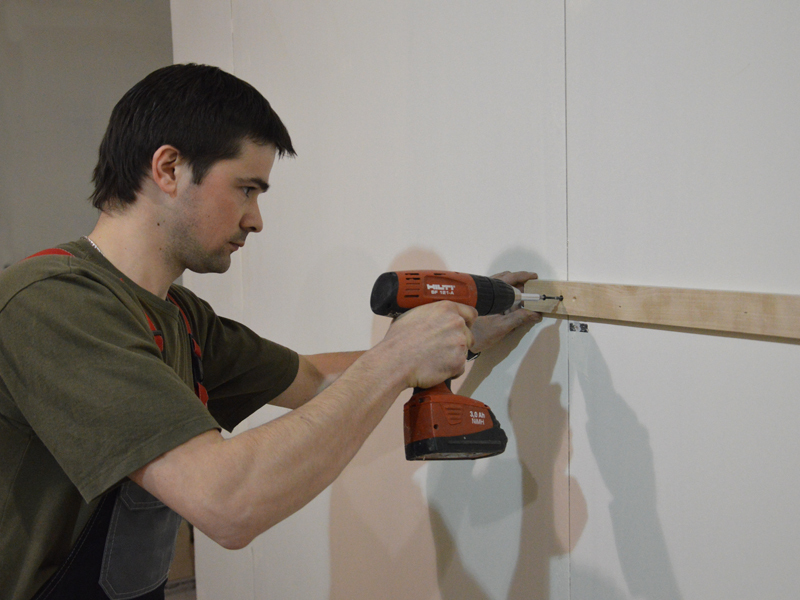 The baseboard is fixed directly to the wall with a pneumatic pin gun. Pins should be at least10 mm longer than the baseboard/moulding. Attachment points should be at the distance of 40-50 cm from each other. Furbish the fixation points using a grease pencil. When finished, clean the dust and waste with a vacuum cleaner, and finish panels with Coswick cleaner. Keep some planks in stock for repair of accidentally damaged planks.